Access the library website 24/7 and become virtually familiar with the library buildings and library resources. From your PC, laptop, netbook or tablet at home or practically anywhere, you can manoeuvre your way around and star gaze at the special Māori collections, with specific Māori items on display. If you have time, become virtually aware of all other resources on all levels of these libraries, prior to visiting. Where do I find NZ Standards online? All of the New Zealand Standards are available online through our Library website. They are easily found on the Library homepage under the Search heading (see below). Click on "IHS Standards Expert." Type in the standard number under "Document number or Organisation" eg 3604. 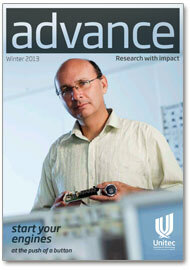 Check out the latest research by staff and students at Unitec in the Winter 2013 issue of Advance out now. Meet our cover star Steve Liggett, a lecturer from Transport Technology who has created a push button motor starter to help rehabilitate amputees back into driving a vehicle. Click here for the Winter 2013 issue. Past issues are also available from the Research department on the Unitec website.